The nice thing about watching a movie like this on video is that you can shut it off and clense your palate by watching something else -- anything else. To grasp the shameless, trolling-for-Oscars concept behind "I Am Sam," an insufferably mawkish, mentally-challenged melodrama of self-aggrandizing proportions, just imagine a tear-jerking "Rain Man" sequel with Dustin Hoffman in a custody battle over a button-cute 7-year-old daughter. The patience-testing, 100-percent predictable picture stars Sean Penn (who I can only assume took the role to finance some smaller, smarter project in the works) in a mannerism-congested performance as a man whose mental capacity has been surpassed by his blond-haired, blue-eyed China-doll kid, and now the state wants to take her away from him. Michelle Pfeiffer (who is more stunningly beautiful than ever) plays Penn's Porsche-driving, stressaholic, hardened career gal lawyer, who reluctantly takes his case pro-bono just to smite the people in her office who think she's a cold-hearted hellcat. Will seeing Penn's devotion to his child inspire her to be a better soccer mom to her sullen teenage son? Gee, I wonder. But that's just one of a throng of cheaply manipulative contrivances, overbearing clichés and conspicuous omissions that plague "I Am Sam." Then the case goes to court, where Penn shows off his mentally handicapped acting chops by performing child-like outbursts when the attack-dog government lawyers say something unfair, as if Pfeiffer wouldn't have coached him on sitting quietly so he doesn't jeopardize their cause. But I suppose that should come as no surprise since she only begins briefing him to testify on the night before he takes the witness stand. Just to up the ante, Nelson (who co-wrote the screenplay with Kristine Johnson) sends Penn to his mopping-up job at Starbuck's Coffee the next morning, wearing a fancy designer suit on loan from the closet of Pfeiffer's neglectful soon-to-be-ex-husband. On this day, of all days, Penn's sympathetic boss decides to let him serve customers (if he's so sympathetic, why didn't he give Penn the day off?). So of course an accident occurs, dousing Penn in java. He arrives late to court and takes the stand, still soaked. As Penn's character would say in his semi-baby voice, "Uh-ohhh..."
As if "I Am Sam" isn't hard enough to sit through, the soundtrack is absolutely inundated with Beatles cover songs so bad they might make your ears bleed. It's meant to play into the main character's obsession with the band ("All you need is love," he insists when anyone suggests he can't care for his child). But if Penn's character could hear these other bands strangling his favorite songs, he'd be the first one to walk out on this movie. 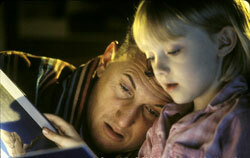 The one thing "I Am Sam" has going for it is Dakota Fanning, the wide-eyed little angel that plays Penn's unconditionally loving daughter. She doesn't just speak her lines, she understands her character, who in turn understands that in many ways she's the adult in her relationship with her father. But the little girl is also afraid of passing up her father in the brains department. She's begun holding herself back in school and pretends not to know big words when reading with her daddy because it makes her sad that he can't keep up. Their tender scenes together are the only moments of the entire film that ring true. Fanning seems to have fully grasped these concepts and plays them with the unfeigned sincerity of an actress three or four times her age. In fact, she's too good -- too polished -- and it becomes uncomfortably clear over time that this little actress was test-tube bred to be a child starlet. She's very talented and positively beautiful -- but in that creepy, feel-sorry-for-her-stolen-childhood, JonBenet Ramsey kind of way.